“PLANET BOY!” …Veglam Cub Reporter, Anguish Young, Catches Up With Free-Style, Rock’n’Roll Super Hero, the amazing, RICKY RAT! Detroit Rock City’s always been home to loads of internationally-celebrated musicians, but few still fly the flag for “That Old Time Rock’n’roll”, like Motown’s own, charismatic guitar-star, Ricky Rat. He’s still playing his Andy McCoy/Johnny Thunders/Bob “Derwood” Andrews/Mick Ronson-inspired, glammy pop guitar, all over the globe. His old band, Trash Brats, have been the subject of renewed interest, in recent years, having been repeatedly showcased in several movies about Detroit. World-renowned for bringing the Mitch Ryder/MC5 tradition of hardworking showmanship to the people, they broke barriers, and kicked down doors, for the next generation of kids, to express themselves, freely, back when New York Dolls/Hanoi Rocks style glam-rock was still perceived as threatening to conservative Middle-America. It has frequently been suggested that the misunderstood Trash Brats might have “signed to the majors”, all the way back in the 80’s, had they only been willing to “tone-down” their circus-atmosphere, hedonistic, stage-shows, or their kooky, cross-dressing, T.Rex-meets-Jayne County, stripper-regalia. They were ALWAYS being advised to dress more like the London Quireboys, and less like the Sweet, or Spiders From Mars. However, their look reflected their ever-changing moods, and Marx Brothers sense of humor. Not everyone fully appreciated the Brat’s idea of fun. They had a comedy-improv sensibility, shared by their friends in the Dickies, Celebrity Skin, and Sloppy Seconds. I know I didn’t understand it, in the early years. I was always a bit of a death-rocker, I suppose-my outlook on the world was always a lot gloomier, than the Trash Brats’. I spent much of my adolescence, hiding-out in my basement utility-closet, listening to “Marrianne” by Sisters Of Mercy, and moping, about the town’s one and only, New Wave chick, who had first introduced me to the Smiths, and Lords Of The New Church, and thus, had stained my life, forever. The Trash Brats had already formed, and were partying in their old bandhouse, before I had even escaped from Bible-School, in South Eastern Kentucky. It took me a bit to catch-on, ‘cos they weren’t ever really aspiring to be furrow-browed, and solemn, all the time, like Bauhaus, or Joy Division, or whoever! They were more like Ken Kesey’s Merry Pranksters! Or the Ramones! Or even, the Monkees! Fun? I wasn’t ready for “fun”, just yet. I may have wrongly perceived them, initially, as bozo metal-dudes, like Motley, or Ratt, when I still identified myself, oh-so-seriously, as “goth”, or “punk”. Whatever. It’s called being Teen-aged…and jealous that their bassist was attracting all my favorite little Vampiras in the Indiana punk-scene! That was all, nearly, a quarter-century ago, and it would appear as if Ricky Rat still constantly continues cris-crossing the world, teaching people how to let down their hair, and forget about their suffering for awhile, and have a good time! Thank You, Ricky! We Americans are brought-up in this relentlessly commercialized, advertising-culture, so we have this nagging tendency to want to put our artists in boxes, categorize, and label everything. The Trash Brats never even cared if they were taken seriously, as long as they were taken to heart. There are many military-minded parts of the fly-over states, that are STILL, not ready for make-up wearing males, but the Trash Brats have always been more concerned with entertaining audiences, and being true to themselves, than in compromising their personal integrity, or sense of humor and style, for Wal-Mart shopper, McDonalds-Rock, or dummy mass-consumption. Americans are trained from birth to be conformists, but still refer to ourselves as mavericks. It’s like, you wouldn’t ask Lux Interior to “tone it down” to be more like Bon Jovi. You shouldn’t ask Stiv Bators to try to “act more like” Brett Michaels, y’know? And BESIDES—didn’t TWISTED SISTER have top ten records in the U.S.? It just takes us uncomprehending yokels forever to get used to any individuality, or spark of originality, because we are all being forever-programmed by our televisions (“Electric Babysitters”) to be marine-macho, square-heads, and “git-r-done” laborers, and taser-happy, police-state shock-troops, in the so-called heartland, of the corporate-owned and operated, good ole boy, U.S. Of A. All the way into the mid-nineties, they were still getting mobbed and gobbed by mis-educated sports-fans, frat-boys, hicks, and even some insecure metal-heads, for their flamboyant, and sometimes campy, stage presentation. While other local bands split for the coasts to pursue corporate-rock contracts, the Trash Brats always stayed true to their hometown punk rock roots, and maintained Detroit, as their central base-of-operations. Their independent releases, such as, “Out Of The Closet”, “The Jokes On You”, and “American Disaster” still do brisk trade all over E-Bay, and in used record stores, nation-wide, and are all essential additions to anyone’s punk/glam rock collection. While there was always a Sunset Strip teeming with all those West Coast, Nikki Sixx-worshipping bands, who maybe, looked cool on their fliers, or claimed similar influences, but the sad reality is, that few of those bands ever wrote good songs, or made good records. They were mostly all about the look, or the life-style, with little to offer in the way of actual music. The Trash Brats may primarily be cult-heroes for their explosive, hard-partying, live performances, but they also possessed a genuine knack for writing meaningful, upbeat anthems, like, “Sentenced Man”, “Bubblegum Girl”, “S-M-U-T”, “Clown Act”, and “You Threw Me Away”, that have always, instantly, rallied rooms full of jaded hard rockers into singing along, no matter where they’ve traveled. 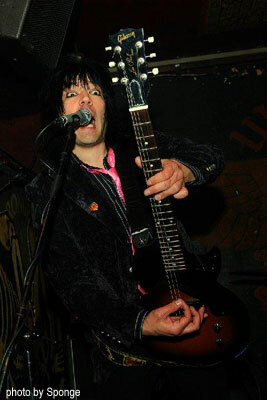 The Trash Brats’ storied career has seen them playing shows with Cheap Trick, Bang Tango, Seduce, Johnny Thunders, G.G. Allin, Pretty Boy Floyd, Joan Jett, and L.A. Guns, and they’ve always left a confetti strewn trail of broken bar-stools, broken hearts, empty bottles, and shiny party hats, wherever they roam. No one has ever forgotten a Trash Brats show. Currently, they’re getting set for a reunion concert in September, starring all four original ‘Brats.This is certain to be a memorable, and star-studded event, attracting punters from all over the world, so book your plane-tickets, and hotel-reservations, now. Ricky’s always had a love for the road, and he tours as much as he can, perpetually staying out on the rock’n’roll highway, like Willie Nelson, Motorhead, or the Ramones. Motown’s where he keeps his junk, but Ricky Rat has always felt most at home, in rock’n’roll. On the stage, in the spot-light, playing his rebel-heart out, for the rock’n’roll people. It’s in his blood-the smell of the fans, roar of the greasepaint. He’s been touring the world, in recent years, with the likes of Bootsey X And The Lovemasters, Texas Terri, Cheetah Chrome, Kevin K., and the Luxury Pushers, and he always enjoys meeting his fans, and other members of the real rock’n’roll-community. He’s also, recently documented some of his adventures, in Kevin K.’s “Thunder-Pop” fanzine. Idealistic rock fans still wonder when Sami Yaffa and Sylvain Sylvain are gonna get it together, and take the classic Trash Brats line-up on tour with the reconstituted New York Dolls! VEGLAM: JUNK MONKEYS-WHERE ARE THEY NOW? RICKY RAT: Not totally sure. I do know that the one guitarist , Dave Boutette, plays acoustic, on the singer-songwriter circuit. I haven’t had a chance to check him out, just yet. VEGLAM: WHAT’S UP WITH THE LOVEMASTERS, WILL BOOTSEY MAKE ANOTHER RECORD? RICKY RAT: -Nothing planned at the moment. We did a few shows this year, but no new songs, or recordings are planned at this time. VEGLAM: GUNS N ROSES OR THE CRUE? RICKY RAT: -Ha Ha. Musically, G n R, but NOT Axl’s voice. “Too Fast For Love” is still pretty unique, too. VEGLAM: HIGHLIGHTS OF THE TRASH BRATS EXPERIENCE? RICKY RAT: – Being able to play to so many people, and being able to meet so many great people, that have become life long friends. VEGLAM: WHAT WAS IT LIKE TOURING WITH CHEETAH? RICKY RAT: -Amazing. It was such an honor for me to be able to share the same stage with him, night after night. To look over and see him playing…wow. It was great to just hang out with him, and hear so many interesting stories from the old days. He is, for sure, one of the most underrated punk-rock and roll guitarists ever. VEGLAM: BEST NEO-GLAM AND CURRENT PUNK BANDS-HEARD SOHO DOLLS? RICKY RAT: – I don’t know-I guess I’m out of the loop. I do love the newest Green Day album though. Awesome songs! VEGLAM: WHEN WILL YOU BE RETURNING TO THE STUDIO? RICKY RAT: -I’m currently starting work on my first solo album. Finally…! I just recorded one song with the Luxury Pushers and will also be doing some more recording with Kevin K., in France, in the fall of 2009. VEGLAM: TELL ME ‘BOUT THE KEVIN K. TOUR…. VEGLAM: HOW WERE YOU AFFECTED BY RON ASHTON’S PASSING? RICKY RAT: -I remember thinking, “Wow! I’m glad that Iggy got those guys back together, and got them out in front of some good crowds..” It was nice to see him get some solid recognition, after so many years. VEGLAM: HOW IS THE CURRENT LXP TOUR UNFOLDING? RICKY RAT: -It was a very fun, very long, tour. Met a lot of great new people, and caught up with some old friends as well. Some of the crowds were very small and we had to cancel out on the final dates of the tour. VEGLAM: BEST CLUBS TO PLAY IN AMERICA? VEGLAM: UNFINISHED BUSINESS? PLANS FOR THE FUTURE? RICKY RAT: -Keep my head together, and survive my latest, personal set-backs. This past year was horrible for me, in my personal life. VEGLAM: ANYTHING I FORGOT TO ASK YOU?